… if you make less than $250,000; or was it $208,000? Either way, President Obama assured Americans making less than the aforementioned figures would not pay “one more dime” in taxes. 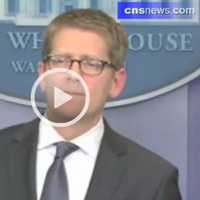 So why won’t Obama administration officials back up the boss? Treasury Secretary Timothy Geithner and National Economic Council Director Larry Summers both sidestepped questions on Obama’s intentions about taxes. Geithner said the White House was not ready to rule out a tax hike to lower the federal deficit; Summers said Obama’s proposed health care overhaul needs funding from somewhere. Along with new and wide-spreading tax we can expect if health care legislation passes at the federal level, remember that Obama has guaranteed everyone will have to pay higher taxes – that’s what they are – if cap and trade legislation goes through. Obama clearly stated energy costs would necessarily skyrocket. Don’t forget the United States is borrowing like crazy to pay for the so-called stimulus package. The federal government alone is in the process of borrowing more than $34 billion each week in 2009. 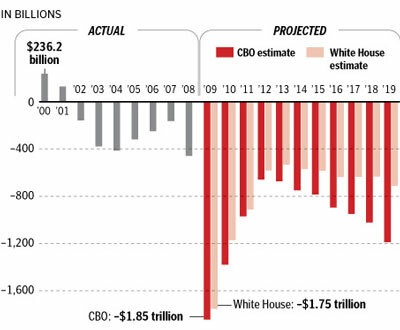 It was bad enough borrowing almost $8 billion a week in 2008, but Congress and the Obama administration has quadrupled the projected deficit in a matter of weeks. This is not a surprise, Obama and the liberal Democrats have been broadcasting what they want to do for years. Did you miss it? Update: Ed Morrissey over at Hot Air has Obama’s tax policy “issues” as the Obamateurism of the Day. Gateway Pundit also on it, and reminding everyone about the campaign promise. Maybe it is time to start mailing dimes to the Obamateur and Congress. I'd put that somewhere between the check is in the mail and the other classic li(n)e.